Is it too early? Do you not want to think about another holiday yet? Or maybe you're in a Grinchy mood from all that Black Friday shopping. Before we get to the mosaics, I want to take a minute to welcome all of my new followers. I'm so happy to "meet" each and every one of you, and I'm honored that you take some time out of your busy day to visit Little Red House. 1. Publish your Mosaic Monday post. 3. Paste the url into the appropriate Mr. Linky box in this post. 4. Type your name in the appropriate Mr. Linky box in this post. Beautiful mosaic Mary. I love your cup tree! My post is about our trip, but there are two or three mosaics included, so I added my link. Hope it's okay. Beautiful Christmas Mosaic! I was going to post another mosaic for today, but couldn't resist in sharing the one that I made on Friday. I do hope that this is alright....sharing one from a few days ago. I've linked to that specific post. Very lovely Christmas decors. I am not planning big this year, we will just keep it simple. I have also visited your featured house at Houzz, and all photos are just beautiful! I have been in hiatus for a week and now I am back in full swing of things. I always look forward to MM every week! We will be at the Hollywood Christmas Parade in 30 minutes. I was so happy when I read these pictures are from last year and I was beginning to feel like a total slacker :) I hope to get some decorating done this week, though! I love your Christmas decorations, I am new to Mosaic Monday so your photos are new to me. Beautiful Teacup tree. Thanks for hosting Mosaic Monday. Whew! I know I have been lazy since Thanksgiving, but was sure gald to hear those are LAST years pics!! They are beautiful tho. Hoping to get some up by the end of the week. Pretty Christmas Mosaic! I am always excited to see your lovely mosaics each week! The slots are filling up fast Mary! Gotta love Mosaic Monday. You come up with such lovely examples. I do remember a couple of the photos from last year, specifically the tea cup Christmas tree and the Paper Whites. Both beautiful. I love your photos! So warm and inviting. Living on the boat limits our decorations, but so far I enjoy lighting the outside for our local "parade of lights" festival. Very clever to have saved pics from last year to share! Your Christmas 'mood' looks beautiful. I'm not really feeling ready to get all revved up for Christmas, but we're hosting our neighborhood party next week so I've had to make a bit of an effort! Mary, I love your home. It's looks so warm and comfortable in all the photos you do. Thanks for hosting again. Thank you for the link to Houzz to enjoy the tour of your home. 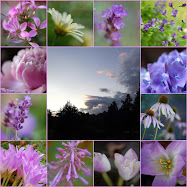 Mosaic Monday has been a lot of fun and I look forward to the sharing from other bloggers. Hello Mary, Your mosaic is beautiful, I love the teacup tree, cannot wait to see what you do this year :-), we spent thanksgiving relaxing before all the decorating starts lol, I have just been enjoying your home tour, happy mosaic Monday to you, Kathy. LOL, I agree with your opinion on eating turkey. Baked Ziti sounds wonderful. Check out my thanksgiving post on Turkey Alternatives. Mary, I am so glad these are last year's pics..so are mine! I just started today..it will take me a long time to get it all done...or will I get it all done?? I love that tea cup tree! As for the turkey...once a year id fine for me too! Oh, I just love those teacups on that Christmas tree. 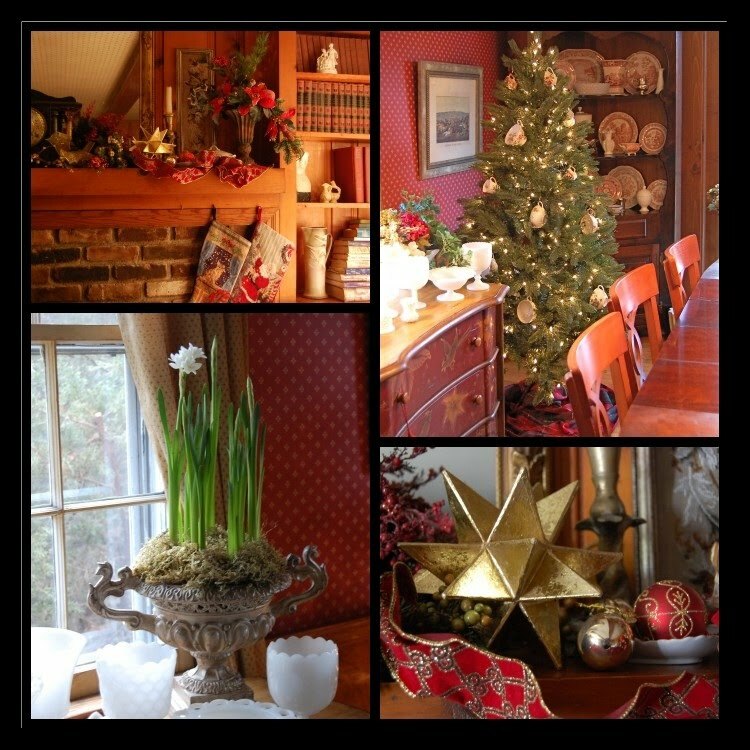 Your mosaic is filled with beautiful Christmas vignettes. I haven't begun to decorate just yet, but the boxes have been pulled out of the storage spot, and it's only a matter of time. Beautiful Mosaic as always Mary. Okay Mary! You've officially put me into the Christmas spirit! ! ! Your decorations are LOVELY and give me a warm, wonderful feeling just looking at them! Thank you for sharing and 'warming me up'! Love the Paper Whites, I had forgotten. I am going to try to find some tomorrow. Beautiful mosaic. I am doing Mr Toast's Tea tomorrow, forgot about the mosaics. I do like your photos...beautiful! Sorry I added my link twice...hope you can fix it. I just had my last turkey sandwich and I'm with you...I never want to see one again! Yesterday I made scalloped potatoes and ham with all the leftover ham. My kids love turkey though, so I can't even think of Pasta next year...lol. Love your mosaic. I was hoping to decorate the day after Thanksgiving this year but I had a distraction. I fell in love...lol. Please visit my blog and see the mosaics of my new love. Have a great week! I keep meaning to buy paperwhites to force. beautiful. i didn't cook at all this year and i felt totally lost. Oh Mary, I love it. Beautiful. I'm so relieved that your Mosaic is of last year's Christmas, I'm still up to my ears in boxes. However,you have set the, Christmas Mosaic, bar high, my friend. I'm not ready for another Holiday just yet, but I'll get there. Beautiful! Although I love everything about Christmas and decorations, my stuff never looks so put together, just a hodge podge of our favorite things! I love your tea cup tree! I have a mini one with mini cups and saucers, but I'll have to try the full size! I don't care one bit that your photos are from last year. They are very inspirational (got to get paperwhites going if I want them to bloom anytime close to Christmas) and afterall, isn't that what it's all about? Blogging that is. Beautiful mosaic, and you're setting a wonderful Christmas spirit. Gorgeous Christmas decor! Now I am ready to pull out the Christmas boxes here! Beautiful Christmas mosaic, don't you just love the paperwhites. . .I am nursing some along but they aren't quite ready to bloom yet! I was making a collage of our newest little grandbaby and decided I'd join in with you today so everyone can see how cute he is! Thanks for hosting it. These are the sweetest Christmas touches Mary...you have such a beautiful eye for creating precious and personal moments. So inviting and sweet. Such a beautiful Christmas decor Mary. I love your mosaic. I had a moment of panic, thinking everyone was so far ahead in their decorating! Feeling better now. Your decorations are lovely! So beautiful Mary...I love seeing all the Christmas decorations! How gorgeous! And I love the tree with the tea cups!! Your mosaic is very warm feeling with the woods and reds. Very pretty! I cannot find Mr. Linky. It is not under the instructions. Am I doing something wrong? LOVE these mosaics Mary and congratulations on your Houzz interview.Good job! Wow I usually have mine up the weekend of Thanksgiving...NOT this year! Maybe this weekend if I am not doing something else! All my decoration are sitting in the study lined up just waiting for me to dig into them and set it all up...if I wait long enough...I will find an excuse to jut box them all up again and put up a tiny tree on the side table LOL...sigh! IT IS A LOT OF WORK! You're not to early at all. I've already got some little lights outside in the two most gorgeous pots with boxtrees. And I'm loving it already. So am I to early too? I love your Christmas Mosaic. It inspired me to get moving. The sooner I put it up decoration the more time we have to enjoy them. Mary, everything looks beautiful. And, I know it will this year, too. Hi Mary -- I've hardly LOOKED at the computer for more than a week, but I had to check your mosaic, and I'm glad I did. Lovely Christmas images! As soon as Howard and I fully recover from the marathon of Thanksgiving, we'll haul the boxes down from the attic and I'll get going on the holiday snazzing up. I really really want to copy your cup tree, and I am shameless about it. Took my in-laws to the airport this morning. My house is my own again! Back to the blog. It is never too early in my opinion! I am so ready for Christmas this year, well, no, I dont have all my gifts or all my decorations up yet, but I feel Christmas happiness right now. I love the tree in your dining room Mary! Little Red House in da houzz!